Plymouth Ghost Tour - Did We Catch Ghost Activity? So what are your thoughts? This was the first time we have had anything "strange" happen while we were on a ghost tour. We were more in awe than scared by the activity. We tried debunking and finding a reason why the light would turn on by itself. As open minded skeptics we believe in the paranormal, but we do not readily jump to the conclusion that a ghost caused something supernatural to happen. We'd love your thoughts. We don't believe this was staged by the company because the woman with us was very believable and she claimed it had never happened before. We also had spent the night "tempting the spirits" as Denise would say by sitting in certain chairs or having men climb the stairs at the cemetery to see if a female ghost would engage. Nothing happened all evening. At this point in the night, the woman with us - who was not the official guide - was telling a story about an event that had happened in the past. We thought it was a weird "coincidence" that right after she said she had told her friend to just ignore the supernatural activity that had happened to her, that the light clicks on as if the spirit was listening and wanted to prove we could not ignore ghostly activity. 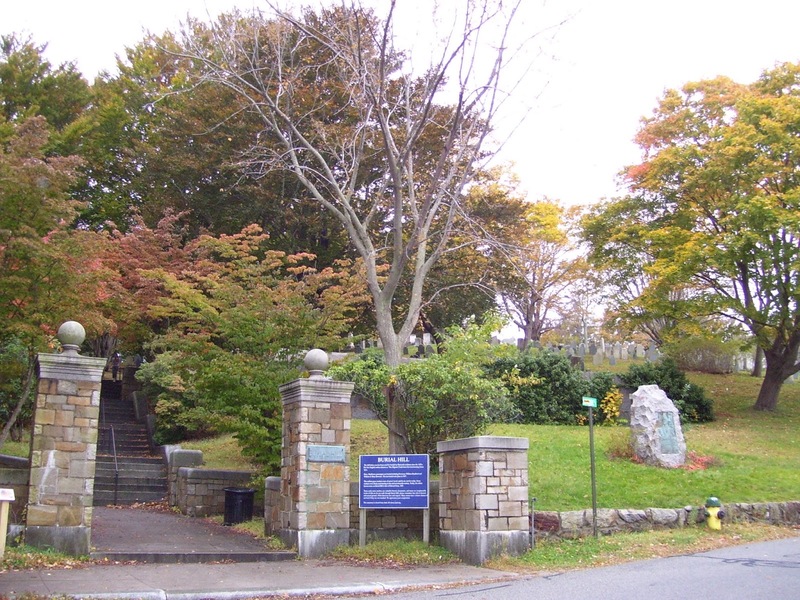 The history of the town of Plymouth, Massachusetts is unique in that most Americans are familiar with the start of this settlement and that is why it is known as "America's Hometown." After all, we have a national holiday inspired by events that took place in Plymouth: Thanksgiving. There are some misconceptions about the history of the Pilgrims and Plymouth and many people may not think about the history that has continued on into the afterlife. 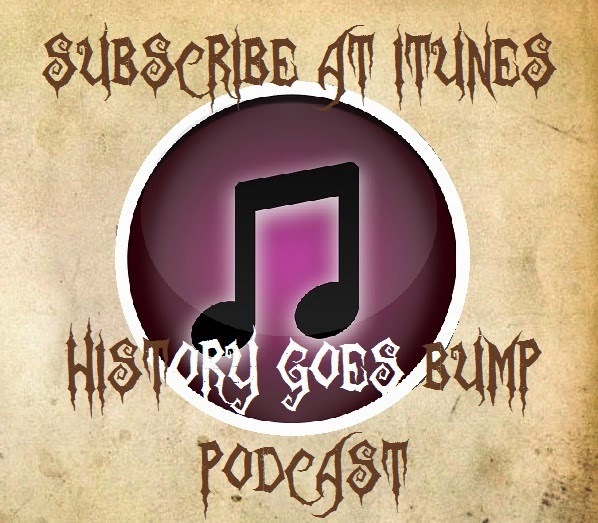 In this episode, we will bring you the history and the hauntings of Plymouth. The Wampanoag Tribe resided in the area that would later become Plymouth Colony. The area had been visited by Europeans from both England and France. These visits ended up bringing a plague that nearly wiped out the Wampanoag. The area was a perfect place for a new colony to begin. A group of people seeking freedom from tyranny, freedom from the mixture of church and state and freedom from state imposed religion decided to start meeting in secret in Great Britain. They found it hard to keep their meetings secret and they decided to flee to a town in Holland called Leyden. Here they could practice their brand of religion, but the conditions in which they lived were not pleasant. They were working as a laborers for low wages and their children were forced to work as well. They decided that a move to the New World would be a better alternative, so they found financing from some rich British financiers and they booked passage on a cargo ship named the Mayflower in 1620. One hundred and two people boarded and spent 66 days below deck in horrid conditions. Along the way, one of them died and a child was born. They landed at the tip of Cape Cod and after exploration, they sailed inland and decided to start their settlement in Plymouth. That first winter was rough and 51 of them passed away. We came to know these courageous people as Pilgrims. It is important to note that Plymouth Plantation was not built upon land that was taken from the Native Americans. The plague mentioned earlier left the natives believing that the land was cursed, so they were happy to let the Pilgrims have the land. When the Pilgrims landed, they found corn hidden by the Pokanoket tribe and they took it because without it they would die. After they were able to grow their own food, they returned what they had taken. The Pilgrims had a good relationship with the Pokanokets and the proof came in the first Thanksgiving. Chief Massasoit had been invited to come to a feast along with his immediate family. The Chief did not understand completely and showed up with 99 braves. The Pilgrims were worried they would use up all their food stores, but the Pokanokets brought lots of meat and the Pilgrims made it through with that assistance. Plymouth Colony was originally a commune like settlement until Governor Bradford realized that people would not work without incentive. So men were given sections of land on which to plant and if they did not grow, they did not eat. Plymouth also started the idea of self rule with governors and pastors being voted on by the people. The members of the society signed the Mayflower Compact to solidify their government. It was a good time, but things for the Plymouth Colony would deteriorate as more and more people came. Encroachment on native lands and other disputes culminated in the King Philip's War in 1675. The King Philip's War was the last effort by several native tribes to try to drive out European settlers lead by the chief of the Pokanokets. It lasted for a little over a year. Thousands died during this war and only ended when King Philip was killed by a colonist. His body was dismembered and his head was staked at the head of the town for 25 years to warn other Native Americans to leave the colonists alone. A sad postscript to add to this chapter is that King Philip was the son of Chief Massamoit. Chief Massamoit had come down with the plague and he was going to die. A Pilgrim named Edward Winslow made up an herbal medicine and nursed the Chief back to health. They became lifelong friends and secured the bond between the Pilgrims and Pokanokets. Winslows decendant engaged in the war with King Philip, so that the bond formed by Chief Massamoit and Winslow was broken by war and death. We took a ghost tour and we scare the numerous supposed hauntings around the center of Plymouth. Is the town really haunted? That is for you to decide! President Zachary Taylor was one of the few American presidents to die in office. He had been in office for a little over a year when he arrived back at the White House for dinner after a long day of festivities celebrating July 4th in 1850. He was hot and very hungry. He found a nice spread before him and he hungrily ate raw fruits and vegetables like cherries, cucumbers and corn and drank down some ice cold milk. It was not surprising that later he felt a tad ill, but what started as general stomach discomfort became severe nausea, vomiting and diarrhea. Fever set in and doctors were called. They gave the president opium for his pain and quinine to reduce his fever. It was to no avail and President Taylor died. It was always assumed he died of gastroenteritis. Clara Rising, a retired professor, became intrigued by Taylor's death and she decided to dig deeper. She soon came to believe that President Taylor had been murdered and that the culprit was arsenic poisoning. Back in the 1800s, there was no security at the White House like what we have today. The Civil War was about to erupt and the country was angry. Taylor was not a fan of slavery while his vice president, Millard Fillmore, was pro-slavery and would sign a compromise allowing slavery in western states after Taylor's death. This was something Taylor had fought against. The President's body was exhumed in 1991 and tested. Traces of arsenic were found, but not enough to have killed him. The medical examiner did not rule out that some other kind of poison could have been used, but the death was ruled natural causes once again. Clara Rising was ridiculed. We may never know for sure what killed the president, but the idea that a theory by one retired professor caused the president to be exhumed and tested, certainly is odd. On this day, July 24th, in 1411, the Battle of Harlaw was waged in Scotland. This was a battle of the clans. A large region of northern Scotland was up for grabs named the Earldom of Ross. One clan was led by Donald who was the Lord of the Isles and the other clan was led by the Duke of Albany, Robert Stewart. Donald first marched to Dingwall and captured the Dingwall Castle during the Battle of Dingwall. The Earl of Mar, Alexander Stewart, gathered a force and met the Donald clan in Harlaw. July 24th in 1411 was a Friday and it was the eve of the Feast of St. James. Weapons used by both sides included swords, battle axes, short knives, spears, maces, shields, bows and arrows. Nine hundred of the Donald men were killed, while the Mar force lost five hundred. The battle was fierce and history has nicknamed it the Red Harlaw. Historians claim the Battle of Harlaw was the hardest fought battle that ever took place on Scottish soil. Most families lost their chiefs and every man in the clan. In the end, neither side was really a winner. The fighting over the area continued for centuries. Mineral Wells, Texas is most famous for the mineral springs that are there. In the early 1900s, the city became a place for those seeking healing from the curative effects of the mineral springs. To provide lodging for these guests, a hotel was built named for its builder, the Baker Hotel. 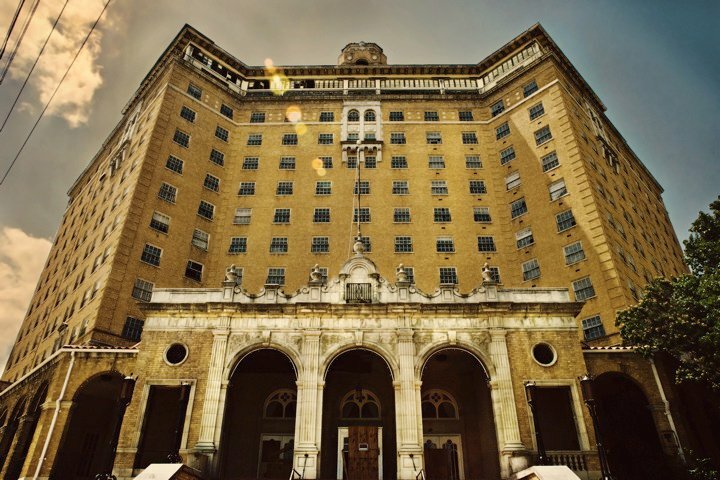 There are more than just mineral spirits hanging around the Baker Hotel. There are allegedly ghosts in this hotel. 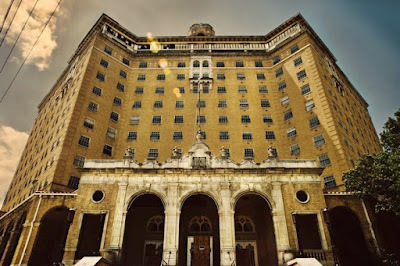 Join us as we explore the history and hauntings of the Baker Hotel. Forty-five miles west of Fort Worth, Texas lies the city of Mineral Wells. The city is smaller in population and retains the old fashioned charm of years gone by in its downtown area. The city became known for the mineral springs that are there and that is why the city was named Mineral Wells. It has long been believed that hot springs and mineral water have healing effects. Long before the white men discovered these healing waters, Native Americans were gathering in these places. It was shortly after the Stock Market crash that led to the Great Depression, that T. B. Baker opened the Baker Hotel. Theadore Brasher Baker was born in 1875 in the state of Iowa. He moved to Texas and became a hotel tycoon. His Baker Hotel Company would eventually own the Gunter Hotel that we covered in podcast episode 47. He designed and built several hotels in Texas, including the Baker Hotel in Dallas and the Hotel Texas in Fort Worth, and became one of Hilton's top competitors. 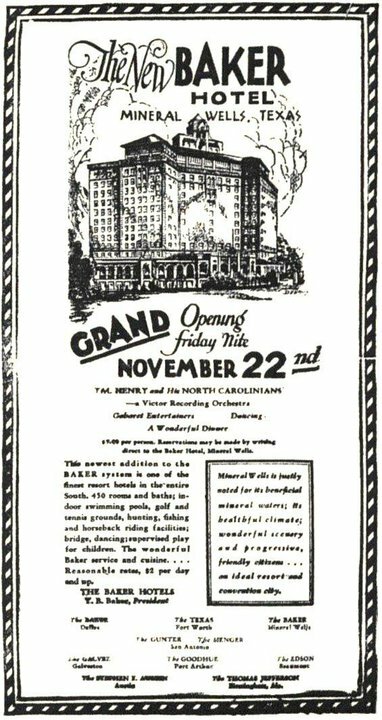 He was approached by the citizens of Mineral Wells and they asked him to design and build a hotel for the city to accommodate tourists and ensure that profits stayed with the city and its shareholders. The Baker Hotel was completed in 1929. Two weeks later the Stock Market crashed. The area where the Baker Hotel was built had been the former home of the The Crazy Hotel. That hotel had burned to the ground in 1925. The Baker Hotel was lavish and rose to fourteen stories and had 450 rooms. The rooms on the twelfth floor and above were reserved as apartments and they all shared the rooftop solarium. The Baker was modeled after Arkansas' Arlington Hotel and the two shared the same designer, Wyatt Hendrick. The first ever swimming pool at a Texas hotel was here at the Baker. T.B. Baker had made a trip out to California during construction and he decided that his hotel must have a swimming pool. It was built over the basement at the front of the hotel and was filled with water from the mineral springs. The hotel was built in the Spanish Colonial Revival style and had two grand ballrooms. A beauty shop, gymnasium and bowling alley were also added. Most tall buildings were reserved for the big cities, so the Baker Hotel was very unique. The amentities for the hotel were top bill and innovative. Turning the key in the lock of the door caused the fans and lights to automatically turn on and off. Ice water was circulated to all rooms through a hydraulic system. The 1940s brought in air conditioning for the entire hotel. The Sky Room at the top of the hotel featured the music of Big Bands as did the first floor Brazos Room. The famous and politicians enjoyed staying at the Baker. The future President Lynden Johnson stayed there as did Judy Garland, Lawrence Welk, Clark Gable, the Three Stooges, Marlene Dietrich and some claim Bonnie and Clyde laid there heads here for rest a night or two. A great article featuring old pictures as well as the current state of the abandoned hotel can be found here and Slate also featured the abandoned Baker here. T.B. 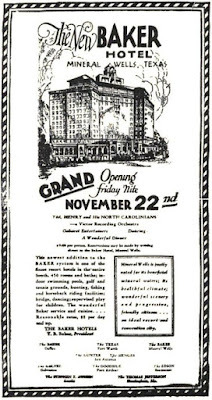 Baker ran into financial difficulties in 1933. In March of that year, Baker had to write the stockholders to inform them that no dividends would be paid that year, so that creditors could get their money. The Baker Hotel Company was sued and the Gunter Hotel was handed over to different management. The other hotels faced similar fates, but the Mineral Wells' Baker Hotel remained with the Baker family. T.B. seems to have decided to step out of the business spotlight at this point and he went on to live a quiet life, dying at the ripe old age of 96. His nephew Earl had wanted the hotel business and took back control of the Gunter Hotel. He then went on to grab the rest of the hotel business and spent much time in court fighting with T.B. 's sister. Ownership of the Baker Hotel Company is murky, but it would seem that Earl controlled most of it in the end. The Baker Hotel did well through the Depression, the 30s and especially during World War II when a military base opened nearby, but by the 50s, the popularity of the hotel was in decline and the appeal of the mineral water had died down. Earl shuttered the hotel in 1963 and eventually suffered a fatal heart attack in the Baker Suite in 1967. Attempts to renovate the hotel are underway, partly funded by the citizens of Mineral Wells. This is going to require many years and nearly $54 million. As of June of this year, $28 million had been collected including money from foreign investors. The project is moving forward, but very slowly. There were many deaths at the hotel and the spirits of these people seem to continue on at the Baker. A woman who enjoyed the scent of lavender, committed suicide in the hotel. She had been the mistress of the hotel manager, who some claim was Baker himself, and he finally broke things off admitting that the two would never be together and so she was distraught. She jumped from the top of the building. The scent of lavender is detected in the hallways on occasion, particularly on the seventh floor. It is believed she had a room on this floor. A night porter saw her apparition for the first time in the 1950s. Maids would find glasses with lipstick on the rims in the woman's former room when no one had been staying in the room. One of the assistant managers of the building was named Ronny Walker. He had several experiences. One evening he heard the clickety clack of high heels coming around a corner toward him. He called out the name of the female manager and got no response. The sound of the shoes faded away. He went to see who had made the noise and found no one. When he asked the manager later, she said she had not been in the hotel. Another time, the lights kept tripping on and off on the seventh floor. Ronny went up to fix the breaker box. He heard something walking towards him, but he could not see anything. He decided to address the spirit out loud and he explained that he was not trying to hurt the spirits there and he just wanted to fix the fuses. There were no more issues with the lights tripping on and off after that. The laundry rooms were in the basement of the hotel. A young man who worked in the hotel invited a buddy to join him down in the laundry room, so they could chat up the laundry girls down there. His supervisor caught wind of the fraternization and went down to the laundry to investigate. The young man was given a heads up and he jumped into an elevator quickly. The doors were closing as his friend followed and he was pinned by the closing doors, which killed him. His apparition has been seen near the elevators. The Brazos Room has also been a scene of unexplained happenings. A group of World War II veterans was enjoying a tour with their wives when suddenly one of the couples stopped in the middle of the Brazos Room and told everyone that they could hear the sounds of dishes being washed. Pretty soon everybody could hear the tinkling of silverware, clinking of glasses and clattering of dishes. Then they heard voices and music. Keep in mind that this was an abandoned building. It was as if a time slip had happened. There is the spirit of a little boy here according to a psychic. In 1933, he and his parents were staying at the hotel while the little boy was undergoing treatment for leukemia. He died there at the hotel. A shaggy dog has accompanied the child ghost at times. Some people claim they have seen a little boy in a wheelchair. Is this the same child? A drunk woman tried to jump into the pool from the twelfth floor. That did not go well. A cook and a maid had been having an affair at the hotel. They fought and the maid threatened to out the affair to the cook's wife. He was enraged and grabbed a knife. He stabbed her to death in the pantry. Her spirit has been seen in the dilapidated kitchen. Mr. Baker died in the hotel and he seems to have stayed in the afterlife. He lived on the tenth floor and has been seen there several times. And he seems to be joined by a red head wearing white. So yes, we have our lady in white yet again. This could be the same woman that hangs out on the seventh floor too. Many people stayed here in life and now many continue in the afterlife it would seem. Are disembodied sounds living on in the present or is there some kind of time loop here? Have the emotions of death by murder and suicide caused the spectral essences of some to remain? Is the Baker Hotel haunted? That is for you to decide! Janus cats are felines born with two faces. In general, these cats have two noses and two mouths and it is those two mouths that make it very difficult for the cat to survive. Most Janus cats live only a few days after birth. A Janus cat named Frank & Louie broke all records when he lived to be fifteen years old. The cat had two noses, two mouths and three eyes. One of the factors that helped him survive was that one of his two mouths was non functioning and had no esophagus connecting the mouth to the stomach. The dangers of choking were greatly reduced because of this. The culprit that took the life of Frank & Louie last December was cancer. The fact that Frank & Louie was given only three days to live when he was born and that he managed to make it to fifteen years with the love of an owner is not only heartwarming, but a tad odd because after all, Frank & Louie did have two faces. On this day, July 19th, in 1692, five women are hung in Salem following their trials accusing them of witchcraft. The Salem Witch Trials are infamous in American history. Perspective has revealed that mass hysteria and false accusations can lead humans to do very bad things. It was in January of 1692, after two girls fell mysteriously ill, that the Salem witchcraft panic began. The area was ripe for mass hysteria. Fear of the Devil was pounded into the people and they had just witnessed the outbreak of a small pox epidemic. Toss in extra fear due to raids by Native Americans and this was a pot ready to boil over. The sick girls claimed to have been part of an occult ritual with a slave woman name Tituba. Sarah Goode and Sarah Osborne were also accused of taking part. Tituba admitted to being a witch and backed up the claims made against the two Sarahs. She also accused two other women. Young girls began to exhibit odd behavior. By May, over 150 men and women were in jail for witchcraft. On July 19th, Sarah Wilds, Rebecca Nurse, Susannah Martin, Elizabeth How and Sarah Good were all hung on Gallows Hill. The mass hysteria continued, finally ending in the Fall. When all was said and done, twenty more than likely innocent people had been put to death and four others had died in prison. Queen's Park in Toronto is a beautiful picturesque park that was a part of the early park movement in Canada. Within it's borders, it holds the magnificent legislative building. The park is encircled by the city that grew up around it and enjoyed by many. Some of those that enjoy the park are doing so in the afterlife. There are at least five spirits that have been encountered at the Legislative Building. There was another building here before the government structure, an asylum. Do the ghosts of the past haunt the marble hallways of this place? 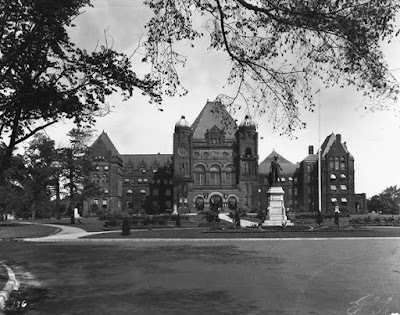 Come with us as we explore the history and hauntings of Queen's Park. Etienne Brûlé was a young man with a deep desire to live among indigenous people. This dream led him to become an explorer and around 1610, he landed upon the shores of Lake Ontario in an area that would become known later as Toronto. Brûlé served as an interpreter and guide for Samuel de Champlain. As an aside, Brûlé would later betray his native France, helping the English capture Quebec City. This same kind of behavior against the Huron people, with whom he lived later, would lead the Huron to stab and dismember him and then eat him. In 1750, Fort Rouille was established in the area and in 1787, the Toronto Purchase happened. This purchase was basically the Mississaugas tribe giving up the land to the British Crown. In 1793, the Town of York was established and that name was kept until 1834 when the city of Toronto was incorporated. King Edward VII officially opened Queen's Park in Toronto during a tour he was taking there in 1860. The park was landscaped with white pines, elm, oak and maples that lined sweeping drives. The park was bordered by Taddle Creek Ravine and McCaul's Pond. Two gated entrances were placed at the north and west ends of the park. The park was named in honor of Queen Victoria. Queen's Park has become a figure of speech for the Ontario Government because in 1893 the Legislative Building was built on the grounds of Queen's Park. It was designed by Richard A. Waite and the architecture is Richardsonian Romanesque in style that incorporates arches, columns and intricate stonework. The building has five stories and was constructed from Ontario Sandstone that gives the structure a pinkish hue. Residents call it the Pink Palace. The exterior was decorated with gargoyles, friezes and grotesques, which are shapes or forms that are distorted, unpleasant and ugly. The interior of the Legislative Building has a grand staircase with a central hallway running from the entrance. At the top of the stairs is the lobby for the Legislative Chamber. Wide corridors break off from the central hub running east and west and those corridors are each bisected by an atrium lined with ornate railings. The west wing is decorated in the Edwardian Neoclassical style with white marble and the east wing is Victorian in style with dark panelling. The Pink Palace took the place of six other buildings that had been used for the running of the government. In 1909, it was decided that expansion was needed and a north wing was added. During that construction, workers needed to make repairs to the roof of the west wings. Beneath that roof were stacks of books and records that made up the reference library. These records were being prepared to move to a fireproof area being built in the north wing. The west wing had proved to be ill suited for preserving documents as it was heated with steam and sunlight crept in everywhere. Unfortunately, what the Toronto Daily Star dubbed a "Scene of Ruin and Desolation" occurred. Fire broke out in the west wing and the wood paneling and papers quickly went up in smoke. The upper floor was destroyed along with the documents. In 1937, the northwest corner of the building became the viceregal apartment for the Lieutenant Governor of Ontario. It is three stories and has a reception room, dining room and offices. The music room is where swearing in ceremonies are conducted. A little fun fact is that the Legislative Building is featured on the front and back of Rush's 1981 album "Moving Pictures." There are several spirits that have been seen in the building ranging from women who were most likely asylum patients to war heroes. The number of ghosts, at least five, makes this building one of the most haunted in Ontario. The grand staircase is one of the main places were full body apparitions have been witnessed floating. Beneath the building are the vaults. Not many people know about them and few have ever been in them. It is believed that wraiths inhabit this part of the structure. The sergeant-at-arms has a desk in the chamber were laws are debated and passed. It is next to this desk that a soldier has been felt and seen standing. Could this be Captain Charles Rutherford who was a World War I hero and served as the sergeant-of-arms from 1934-1940? Rutherford had joined the 5th Canadian Mounted Rifles and he was wounded in battle. After he recovered, he found himself back in Northern France and one day he was separated from his team. He happened upon a group of Germans and he should have been a dead man. Rutherford was a quick thinker and a good bluffer. He told the Germans to surrender immediately because they were surrounded on all sides by Canadians. The Germans believed him because what fool would try such a thing. They surrendered and Rutherford was awarded the Victoria Cross for bravery. He died in 1989. Has he come back to a building he once loved? Several psychics claim that a ghost claiming to be named Charles is there. There is the ghost of a man with a red beard who once served as Speaker before he found a better offer as minister of crown lands. His name was Richard Scott and he has been seen around the Speaker's apartment in the building. A medium said that there is a strong feeling of service coming from this spirit. A former Lieutenant Governor still seems to be in the building. In 2006, an aide to the current Lieutenant Governor at the time, witnessed a man leaving the vice-regal washroom. The man went into the music room and when the aide followed because he did not recognize the man, he was nowhere to be seen. Some time later, a janitor was cleaning in the area and saw a man in a swallow tail suit near the washroom. He reported the man in broken English and when he was asked to identify the man, he pointed to the portrait of a former Lieutenant Governor. No one will reveal which portrait it was. Inside the vice-regal apartment, a man in red has been seen. There is a soldier seen near the stairs that wears red, so some speculate that these spirits are one and the same. Some of the Lieutenant Governors are wearing red uniforms in their portraits though. There are three female ghosts here as well. It is believed that they are former patients of the asylum that once stood on the grounds. The asylum was named the University Hospital for the Insane and then the Auxiliary Female Asylum. It is important to note that the asylum had been built from limestone and much of that stone was used to lay the foundation of the Pink Palace. One of the women had hung herself in the basement. Her apparition is seen hanging from a hook in the basement. Another of the women, named The Maiden, has a checked dress that she wears in an unusual way. It is usually thrown over her head. The third woman has stark white long hair. One of these women is usually seen in the fourth floor attic and she is angry. She gives off a malevolent feel and is vengeful. There are also reports of a woman in white, named the White Lady being seen on the third floor and she is heard wailing and moaning. This could be the woman with long white hair. Members from The Searcher Group were given access to the building and two of their mediums claimed that a spirit couple was dancing in the hallway in 1800s ballroom attire. As to who these people could be, no one knows. The group also captured an EVP of a woman humming and another of a man saying, "Hello." The smell of booze and smoke was detected by members of the group in various areas of the building. Could the beautiful building in Queen's Park hold more than just legislative meetings? Could the angry and lonely souls from the asylum created an air of the supernatural because of the emotions left behind? Did some of the patients decide to stay? Are those who served the Parliament in the past still feeling duty bound to stay and continue their work? Is Queen's Park Haunted? That is for you to decide! Lund University is located in Sweden. The school's original benefector and chancellor was Bishop Peder Winstrup. When the Bishop died, his body was preserved with herbs and berries. This caused the body to be mummified. It is so well preserved, that the mummy actually looks very similiar to a painted portrait of Bishop Winstrup with beard and mustache. The University has been studying the mummy for 350 years, cracking the coffin open every few decades. When the casket was opened most recently, an unusual discovery was made as the coffin underwent a CT Scan. Another body was in the coffin. The body was that of a fetus, most likely in the sixth month of development. It was below the feet of the Bishop and had never been seen before. Unbaptized babies were denied a Christian burial back during the Bishop's time, so researchers believe the baby was placed in the coffin as a stowaway, so that it could have a proper burial. DNA tests are being conducted to make sure that...ahem...there is no relation between the Bishop and the baby. A Bishop's mummy so well preserved it is recognizable and concealing the body of a baby for 350 years, certainly is odd. On this day, July 14th, in 1853, the first US World's Fair opened in New York City at the Crystal Palace. Formally known as the Exhibition of the Industry of All Nations, this exhibition followed the first such display in London in 1851. The exhibition was meant to display the greatest inventions in the world. A special building was erected in what is now Bryant Park. The building was made from glass and iron and modeled after the building built for the World's Fair in London. It was built in the shape of the Greek cross and had a dome 100 feet in diameter. The Crystal Palace would burn to the ground in 1858. President Franklin Pierce gave the opening address. When the fair closed in November 1854, 1.1 million people had passed through the doors. The grandest industrial achievement of this fair was Elisha Otis' elevator equipped with a safety brake. He demonstrated the invention himself with a dramatic free fall. Three years later the first passenger elevator was installed in a New York City store. Southern charm abounds at the beautiful Antebellum Myrtles Plantation. The mansion has been restored to its former glory and houses much of the original architectural and decorative features. The city where it is located has a deep history and once was a very important city in the south. The Myrtles Plantation is considered one of the most haunted places in Louisiana. 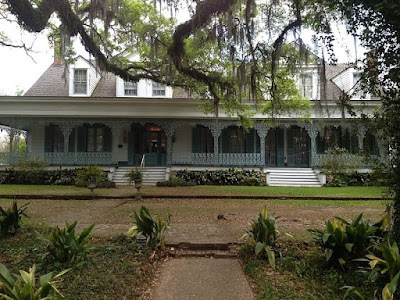 The story behind the hauntings is tragic and many people claim to have had experiences while staying at the Myrtles, which is now a Bed & Breakfast. Join us as we explore the history and hauntings at the Myrtle Plantation. The land upon which the Myrtles Plantation was built used to be home for the Tunica Indian tribe. They used parts of the land as a burial ground. Bayou Sara was established on the Tunica Indian land and became a busy port located in a strategically perfect place on the Mississippi River between New Orleans and Natchez. The area was considered part of the colony of British West Florida and the Spanish had taken control. Spain governed the area from 1783-1810. This is one of the only areas that did not end up with French influence. Just above Bayou Sara on a bluff, the town of St. Francisville was established. There was good reason for people to prefer to live above Bayou Sara. The area was plagued with fires and floods. St. Francisville soon became the commercial center of the plantation lands that surrounded the town. Many of the structures in Bayou Sara were transferred up to St. Francisville. In 1810, Spain was pushed out and St. Francisville became the new capitol and governed as a Republic for 74 days until the United States annexed the land into the Orleans Territory. The story of the Myrtles Plantation begins with the Whiskey Rebellion. This push back by American farmers happened after the Revolutionary War when America's government was just getting started. A large debt was run-up during the war and the nation needed a way to pay it back. Some of that debt included paying back those Americans who fought during the war. Congress used its powers of taxation to levy a tax against liquor, the chief liquor being whiskey. Farmers who were distilling their crops into whiskey were angry because they felt like this was taxation without representation and wasn't that what they had just fought against? The protests turned violent making it impossible for the government to collect the tax. The military got involved and soon the rebellion was suppressed, but collection of the whiskey tax was never really accomplished. The whole ordeal led to the formation of political parties and Thomas Jefferson's Republican Party repealed the Federalist Party's whiskey tax. General David Bradford took part in the Whiskey Rebellion leading to his nickname, "Whiskey Dave." He was born to Irish immigrants and owned land in Pennsylvania. He fled to avoid arrest and ended up in Bayou Sara where he bought 650 acres from the Baron de Corondelet. He built an Antebellum mansion there in 1794 and named it Laurel Grove. Whiskey Dave passed away and his wife was left to manage the property with their son-in-law Judge Clarke Woodruff. Woodruff had been a student of Whiskey Dave and had married his teacher's daughter. Life for the Woodruffs was tragic. Judge Woodruff's wife died of yellow fever and sometime later he lost two more of his children to the dreaded disease. He remodeled the mansion after buying the property from his mother-in-law who stayed at Laurel Grove until her death in 1830. In 1834, Ruffin Grey Stirling bought the mansion and completed renovations. Stirling would double the size of the mansion. The mansion that people can visit today is a result of the work Stirling did on the house. The veranda was expanded to 125 feet and the ornate ironwork that is so typical of New Orleans, Louisiana and Savannah, Georgia was wrapped around the veranda. The foyer contains examples of open pierced freizework and faux-bois. Faux-bois is the fancy way the French describe fake woodwork. It has roots in the Renaissance. 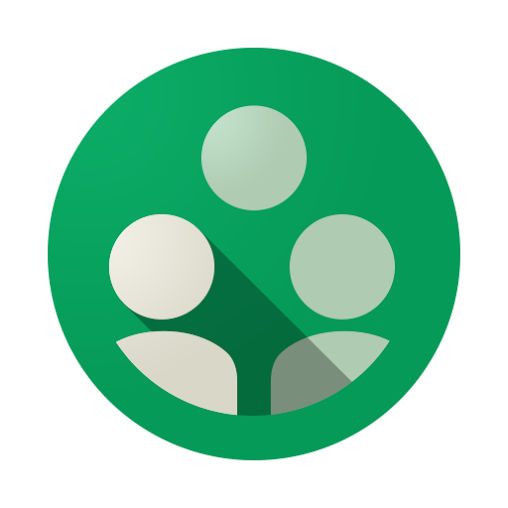 Freizework is a type of molding. The foyer also holds a 300 pound chandelier made from Baccarat crystal. The entrance contains the original hand-painted and etched stained glass and the design is modeled after the French Cross, which was believed to ward off evil. The mansion also features Carrara marble mantels, gold-leafed French furnishings and Aubusson tapestry. The home was renamed to the Myrtles Plantation for the numerous Crepe Myrtles that grow on the property and in the area. Stirling died of consumption in 1854. His wife, Mary Cobb, managed the property after that and the Stirling family seemed to have as much tragedy as the Woodruffs. Only four of their nine children survived to adulthood. One daughter's husband was mudered on the front porch, shot by a horseman. Mary managed to hold onto the plantation despite the great loses suffered during the Civil War. They were looted many times by soldiers and her investments in sugar plantations went nowhere. She died in 1880, still owner of the Myrtles. Her son Stephen then bought the home. Oran D. Brooks became the new owner in 1886 because the property was too heavy in debt for Stephen to handle. Brooks then sold the house to Harrison Milton Williams in 1889. The Williams family held the property until the 1950s when Marjorie Munson purchased the plantation. The story of hauntings began then, which we will discuss in a minute. The Myrtles continued to change hands until the 70s when Arlin Dease and Mr. and Mrs. Robert F. Ward became owners. They did more restorations. Judge Woodruff took up with a slave girl and began an illicit affair. Her name was Chloe. Chloe got a little too comfortable in the house and one time she was discovered by the Judge's wife eavesdropping on a business deal. Mrs. Woodruff cut off the slave's ear and banished her to the kitchen. The good judge was a womanizer and he quickly moved onto another slave girl. Chloe feared that if she fell out of favor, she would be pushed out of the house and forced to work in the fields. Chloe hatched a plan to get back in good graces. If the Judge's children were to become sick, then she could nurse them back to health and secure her place in the house. She baked a pie and included poisonous oleander leaves. She meant to make the children slightly ill, but her knowledge of herbs and such was lacking and she actually killed two of the three children and Mrs. Woodruff. Chloe had made a mistake in telling her fellow slaves of her plan and so when the children died, the other slaves worried that they would be accused of helping Chloe. So they dragged her from the house, hung her and put her body in the river. Did this really happen? There is no historical record for it, but an interesting picture seems to indicate that something happened to the slave girl named Chloe on the property. The picture of the ghost of Chloe has become well known and is a very convincing photo. In 1992, the Bed & Breakfast owner was snapping pictures for the insurance company. She was stunned to see what appeared to be a slave girl in one of the photos. The National Geographic Explorer featured the Myrtle Plantation in a documentary and they used the picture in the film. They were convinced it was the real deal. In May 1995, Mr. Norman Benoit who was a patent researchist asked to investigate the photo and after his examination, he concluded that the picture was real and that the figure in the picture was human based on the proportions. The length of the shoulder to the elbow, the length of the elbow to the wrist and circumference of the head were perfectly human. And there is not just the photo as evidence for Chloe. She has been seen as a full body apparition or sometimes it is just her face that appears before a sleeping patron who is awakened in the middle of the night. There is a haunted mirror in the home. People claim to see handprints in the mirror as though they are coming from within the mirror and many pictures have been taken that back up those claims. Could these be handprints in the wood behind the mirror coming through in photos or are spirits really trapped. We've discussed in other podcasts how it is believed that spirits could become trapped in mirrors. A ghost in a green bonnet or turban has been seen on numerous occassions and could possibly be the ghost captured on film instead of the one that legend has named Chloe. The movie "The Long Hot Summer" was filmed here and one day the crew moved some furniture around before filming a scene. They left for a bit and when they returned, they found the furniture moved back to where it had originally been located. A gateman once witnessed a woman in a white period dress come through the gate, continue toward the house without acknowledging him and he saw her vanish into the house. He quit that very day. So many experiences have happened at the Myrtles Plantation that are unexplainable. It is clear that something is happening at the beautiful Bed & Breakfast. Is the Myrtles Plantation haunted? That is for you to decide! In London’s St. Pancras Old Church's cemetery stands a tree that is known as the Hardy Tree. The tree was named for the author Thomas Hardy. In the 1860s, the London rail line was in need of more room and it was decided that part of the cemetery would be the perfect spot to route one of the lines. The bodies needed to be exhumed and moved. The job was dumped on an architectural firm's lowest employee who just happened to be the future famous author Thomas Hardy. Hardy moved the bodies, but he was left with another issue: the hundreds of headstones left in the yard. Hardy noticed an ash tree off to the side that was not near the future railway. He decided to move the headstones over to the ash tree. He placed the tombstones in circles around the tree. Many were practically on top of each other. As the years have passed, the ground around the tree has absorbed many of the stones. And the tree itself has grown around some of the gravestones. It creates a stark image of life and death melding together. And one thing is for sure, the Hardy Tree certainly is odd. On this day, July 9th, in 1869, the corn cob pipe was invented in Missouri. Henri Tibbe was a Dutch immigrant who was a woodworker. On July 9th, a local farmer came to him with a corn cob that he had whittled the middle out of and asked Tibbe if it was possible for him to use his lathe to refine the process. Tibbe gave it a try and soon the corn cob pipe was so popular that the Dutchman discontinued all his other woodworking and focused entirely on making pipes. The corn cob pipes were cheap, although many considered them unelegant. Corn cobs were dried for two years and then the lathe was used to hollow them out into bowl shapes. The outside was lacquered, usually after being dipped in plaster. Shanks made from pine wood were inserted into the bowls. Corn cob pipes are still popular today because they require no break-in period. The Missouri Meerschaum Company is the world's oldest and largest manufacturer of cool, sweet-smelling corn cob pipes and they have been doing it since 1869. The company was founded by Tibbe and his son. The name Meerschaum was derived from the German word for sea foam and is the name for Turkish clay that is used in more expensive pipes. Tibbe tacked on the Missouri part as a coy play to elevate the pipe's appeal. So next time you see a Popeye cartoon, you know where that corn cob pipe came from! The Old Jail in Charleston, South Carolina is an architecturally beautiful building that dates back to the early 1800s. The jail has seen its share of thieves, murderers and even pirates. A stone building that has stood for centuries tends to carry far more than just memories of years gone by. The spirits of those who were locked inside the structure still seem to resonate within those walls. 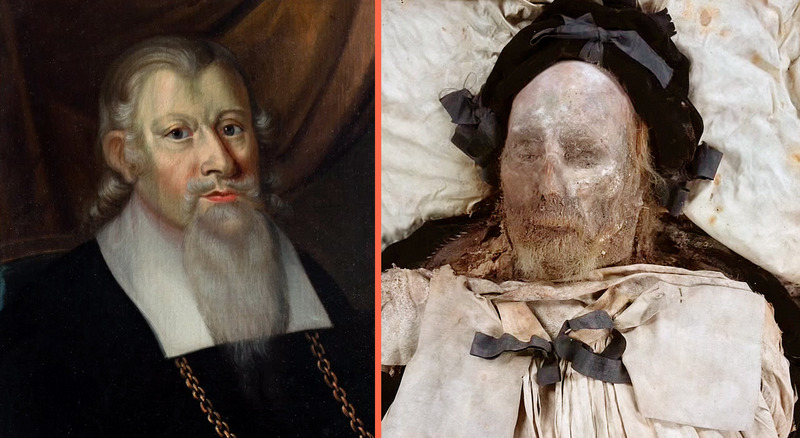 Death may not have been the end for those condemned. Do some of these people still carry on in the afterlife? Let's explore the history and hauntings of Charleston's Old Jail. The city of Charleston is one of the original cities in America, dating back to 1670. English colonists were the first white men to come to the area and in 1680, they officially laid out a plan for the city that was similiar to other cities with block squares plotted out. The city was originally named Charles Town in honor of King Charles II. The city was a prime location as a seaport, but it eventually grew even more successful in other economical ways. Rice, cotton and indigo all contributed to that success. Charleston was long considered the capital of the south. Charleston also holds the inenviable position of being the location for the start of the Civil War. The first shots of the war were fired at Fort Sumter in Charleston. Charleston took a long while to recover from the devastating effects of the war. Trade and industry helped the city to thrive again. When Charleston was initially plotted out, a four acre square of land was set aside for public use upon which several buildings were later constructed. These included a poor house, a workhouse for runaway slaves, a hospital and a jail. The Old Jail was built in 1802 and was four stories tall. A two story octagon tower was built atop the four stories. Robert Mills was an architect known for building fireproof buildings and in 1822 he designed a fireproof wing with cells for the jail. This wing was later replaced in 1855 by architects Barbot & Seyle with an octoagonal wing. They made other alterations to the building, which included the addition of the Romanesque Revival details. This type of architecture is known for its towers and round arches and dates back to Medieval times. An earthquake badly damaged the building in 1886 and the tower and top story were removed. The jail housed a variety of prisoners and many times there were far more prisoners within the walls than the building was meant to hold. Up to 300 prisoners were held sometimes in a structure meant for 130. This made bad conditions worse. Sickness would wreak havoc in the building. The historic record indicates that during the time that the jail was open, up to 10,000 people died there either from injury or illness or because they were condemned to die. That's a lot of people. The jail was in use for 211 years, closing its doors for prisoners in 1939. Criminals were denied food, whipped and shackled. The people locked up in the Charleston Jail were guilty of many different crimes. Some were just common thieves and others were murderers. Still others were civil rights activists. Denmark Vesey was one such prisoner. He was a freed slave who organized meetings in his home and collected guns and ammunition for a rebellion that he was planning. Nine thousand slaves were to join forces to fight for rights and freedom, but several of the slaves worried that they would fail and be in bigger trouble than they already were, so they betrayed the other conspirators. Denmark was arrested and incarcerated at the Charleston Jail. He was tried and hanged along with 35 other blacks. His revolt would have been the largest. Instead of bringing freedom, laws were tightened on blacks. Civil War soldiers served time at the jail. Members of the 54th Massachusetts were some of those who did time. That regiment was made famous in the movie "Glory." Other federal prisoners were held during the war along with Confederate soldiers. Jacque Alexander Tardy was a pirate who lived from 1767-1827. He was known as Tardy the Pirate. He was a small man who walked with a cane. Tardy was born in France, but fled to Hispaniola with his parents during the French Revoltuion. The Haitian Revolution forced the family to America where they lived in Philadelphia. Tardy took on the trade of being a tinsman, but later he joined Captain John Smith on the USS Congress. He would later try to steal the Captain's valuables and sell them to the crew and he was publically flogged. He loved poison and had a penchant for poisoning those with whom he had issues. Captain John Smith seems to be his first victim. Later, he sailed aboard the Maria for a return to Charleston, South Carolina and he poisoned the Captain and seven other crew by putting arsenic in their hash. Tardy blamed the ship's cook who was hung for the crime. The same thing happened aboard another ship named the Regulator and again, Tardy blamed the cook. A confidant turned him in, but he was only tried for conspiracy and served seven years at Walnut Street Prison. He later tried to steal a boat and was caught and at this time he was put in the Charleston Jail where he served two years. He would later go on to try to take over another ship with some other men and ended up slitting his own throat in the Captain's quarters to avoid capture. America's first female serial killer was housed at the Old Jail. Lavinia Fisher was born in 1793. She married a man named John and the two ran a hotel in Charleston named Six Mile Wayfarer House because it was six miles outside of town. It was a popular place for men to stay at while traveling. The problem is that these men never checked out. They just disappeared. The missing men were reported to the police and they began to notice that all the men could be traced back to the Six Mile Wayfarer. Lavinia and John were good at what they did. The authorities could find no evidence of wrong doing. And the town loved the couple. So the police just dropped the investigation. Sometime later, local townspeople heade over to the hotel, but they found no wrong doing. Things changed for Lavinia and John when a nice young man stopped by to see if their was a room for the night. Lavinia said they were full, but invited him in for tea. He introduced himself as John Peeples and he chatted with Lavinia for quite a while giving her far too many details about his life. He didn't like tea, so he had left it untouched and when Lavinia left the room, he dumped it out. She returned and told John they had a vacant room. After getting inside his room, John had a weird feeling. Lavinia's husband had stared at him all night in an unsettling way as he chatted up Lavinia. He also felt he had shared too much and perhaps he might be robbed. He decided to sleep in a chair by the door rather than the bed and good thing because in the middle of the night he was awakened by a loud noise. He was shocked to see the bed disappearing into a hole. John jumped out the window and rode his horse to the police who arrested Lavinia and her husband. When the police searched the hotel they found Charleston's Murder Castle. There were secret passages and mechanisms that opened floorboards. A sleeping herb was found and police believe these herbs were used to put victims to sleep. The remains of 100 people were found in the basement along with belongings of many people who were not the Fishers. John and Lavinia were tried and sentenced to hang, but they were given a chance to repeal. As they waited in the Old Jail, they hatched a plan to escape. They made a rope from linens and John shimmied down first. He broke the rope and Lavinia was stuck in the cell. He couldn't leave without her, so he returned to the jail and they were put under better security. They were hung on the gallows behind the jail on February 18, 1820. John went quietly, but not Lavinia. She ranted and raved and refused to walk to the gallows, so she was carried. Her last words were, “If you have a message you want to send to hell, give it to me – I’ll carry it.” She flung herself off the gallows and hit the crowd who were stunned by the awful sneer that spread across her dying visage. Historians have never found any evidence that 100 bodies were in the house. Only two bodies were discovered. And many believe that the Fishers were part of a group that merely robbed people. But that doesn't explain why so many men went missing. The building was vacant for 61 years after it officially closed. The American College for the Building Arts purchased the building in 2000 and began renovations. Much of the original structure still stands today. There are several tour companies that offer ghost tours of the Old Jail. They are listed below. And the reason there are ghost tours is because, of course, some spirits of prisoners who met their ends at the jail have decided to stay. Even when the building was vacant, cops walking by reported hearing doors slamming and screams. As occurs with renovations in haunted structures, many weird things happened starting in 2000 when restoration efforts were begun. The apparition of a jailer carrying a rifle was seen by workers on the third floor. They witnessed the spirit walk right through the cell bars. Spooktacular Crew member Jessie who suggested this location to us has been to the Old Jail and had her own unexplained experiences there. She told us that she was on a ghost tour at the jail and had a panic attack in one of the rooms. She also felt as though something grabbed her in a room where POWs of the Civil War were kept. Someone else on one of the ghost tours remarked in a review that "I did see something very strange inside the jail- a large ball of light flying up a set of stairs." Other people who have taken the Bulldog Jail Tour claim that they have been pushed, slapped, touched, choked and scratched. The jail is stuffy and hot, but at times people report seeing their breath and feeling an icy cold draft. Lavinia Fisher was reportedly buried in the Potter's Field next to the jail and instead of heading off to Hell, she seems to have decided to stay at the Old Jail in the afterlife. Right after she was hung, residents claimed they saw Lavinia's face behind the bars of the cell she once occupied. Lavinia insisted on being hung in her wedding dress and her apparition is seen inside the jail wearing a wedding dress. The dress was white and bright red. The Paranormal PC was set up in the room called "The Octagon," where some of the worst criminals, including the Fishers, were kept. After running undisturbed for an hour, it recorded substantial deviations in magnetism with no evidence of conventional cause. Numerous people witnessed "orb-like" anomalies with their naked eyes. And others, primarily females, witnessed cloudy forms, either black or white, swiftly moving down halls. This was most prominent in the basement, and led to an outstanding event around 4-4:30am Saturday morning. Around ten people, including Mark R. Jones and Rebel Sinclair, monitored the basement as the author operated a strobe light. Suddenly, one observer exclaimed she saw a shadowy, humanoid form. Others gasped as they saw it, as well, and were overcome with emotion. The author shut off the strobe light, at which time he witnessed a dark silhouette block light entering the building through a few long, vertical cracks on the facing wall. When he turned the strobe back on, there was nothing visible blocking his view of the light. Around midnight, the author and several other team members heard the distinct sound of chains being dragged across the floor of The Octagon. All lights were turned on, and though nothing was seen, the sound was extremely pronounced. It lasted less than 30 seconds, and no one was able to document the sound. It never occurred again. Ghost hunters visited the Old Jail in 2012 and one of their cameramen was scratched. The spirits don't seem so nice at the Old Jail. Is that because the spirits belong to those who were corruptible in life? Could it be possible that people are just imagining these events because of the creepy nature of the jail? Has the stone captured the elements of the past and now what is seen is residual? 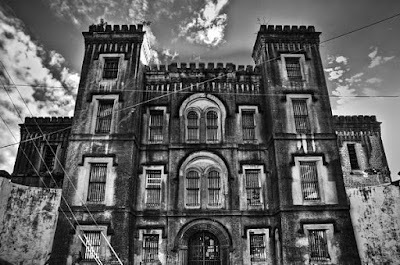 Is the Old Charleston Jail haunted? That is for you to decide! In ancient Egypt, a large temple was built to the jackal headed god named Anubis. Anubis was associated with the afterlife and because he had the head of a dog, a burial chamber was built next to his temple that has become known as the Canine Catacomb. The catacomb once held the bodies of eight million dogs and puppies. The fossil of an ancient sea creature millions of years old was embedded in the ceiling of the catacomb. The dogs were not just buried. They had undergone the mummification process. Archaeologists believe that the Canine Catacomb was the work of an animal cult. That cult held much significance in the Egyptian economy. Dogs were not the only animals mummified in reverence of the gods of Egypt. Other catacombs have contained the mummified remains of baboons, ibis, hawks, jackals, foxes, cats, mongooses and bulls. It is believed that young dogs were merely bred for sacrifice and mummification. These dogs were not killed by brutal force, but by starvation and dehydration. Aidan Dodson, a senior research fellow in archaeology at the University of Bristol in the United Kingdom, said of the animal cults of Ancient Egypt, "There's probably a vast amount of trade coming in, not only for producing the animal mummies, but people wanting food, lodging and drinks, It's probably an ancestor of a mass tourism industry." The idea that mummifying animals was once a major part of tourism certainly is odd. Well, of course, on this day, July 4, in 1776, the United States of America declared her independence from Great Britain. Independence Day did not become an official holiday until 1870, but the history of the day is a vital part of the American experience. Beginning in June of 1776, representatives from the thirteen colonies decided it was time to break free from Great Britain. The American Revolution was already underway. Thomas Jefferson was assigned the task of drafting a document that would state America's intention to become independent. Colonists were angry over taxation without representation and they no longer wanted to be under a monarchy. The Continental Congress voted on July 2nd in favor of independence and two days later they adopted the document Jefferson wrote that we know today as the Declaration of Independence. The most well known line from the Declaration is, "We hold these truths to be self-evident, that all men are created equal, that they are endowed by their Creator with certain unalienable Rights, that among these are Life, Liberty and the pursuit of Happiness." Such sentiments resonate with all people regardless of country. The Buxton Inn is the state of Ohio's oldest continuously operating inn that has stayed in the same location and same building. Since 1812 it has offered travelers a comfortable place to stay. Perhaps the inn is too comfortable. Based on the experiences of patrons and employees, it would seem that the inn is so inviting, many spirits have decided to stay here in the afterlife. Staying at the inn is like taking a step back in history. Join us as we step back and investigate the history and hauntings of this grand old inn. The village of Granville is a New England style community found in the state of Ohio. Originally, the area was settled by Mound Builders and the evidence of this can be found in the various mounds located near Granville. Alligator Mound is one example. The Wyandotte tribe settled the area until white settlers moved onto the land. After the Revolutionary War, the US government surveyed the future home of Granville and laid aside many units for those who served during the war. Welsh immigrants arrived in the early 1800s and bought units of land, chasing off squatters that had taken up residence. The first of these was Sampson Davis, a Welshman from Philadelphia, and within a few years, the population of Welsh immigrants grew. Many of the roads in Granville have Welsh names due to these earlier settlers. The Welsh were joined by New Englanders. Many of them arrived from Granville, Massachusetts and that is how Granville Village got its name. The New Englanders joined forces and formed The Licking Company and used that to purchase thousands of acres of land. They masterminded a community before they ventured to Ohio and when they arrived they quickly built a town square with churches on the corners, a saw mill, a corn mill, a school, library and homes. Some of the original structures still survive today and one of those buildings is the Buxton Inn. Orrin Granger was one of the New Englanders that traveled from Granville, Massachusetts. He had been born in Massachusetts in 1788. He bought a unit of land and built a tavern on the site in 1812. He named it simply, "The Tavern." The Tavern offered more than just rooms. The inn held the first post office for Granville. It was also a stop on the stagecoach line that ran from Columbus to Newark. The stagecoach drivers would cook their meals in the stone fireplace located in the basement of the inn. After eating, they would curl up on pallets of straw that were located in the basement as well. 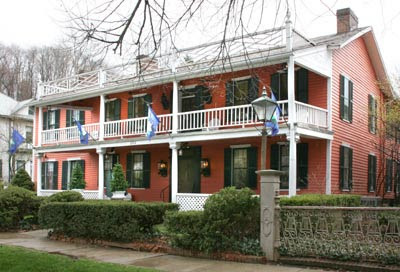 Orrin was friends with General William H. Harrison and he stayed at the inn before he became President. Harrison rode his horse into the Buxton's ballroom on one occassion. Orrin was not the innkeeper for very long as he died in 1821. He was only 32 years-old at the time. The inn changed hands several times right after Orrin's death. An east wing was added in 1829 and in 1851, a west wing was built. This gave the inn a horseshoe shape with a court in the middle. James W. Dilley bought The Tavern in 1858 and renamed it "The Dilley House." In 1865, Dilley sold the inn to Major Horton Buxton who again renamed the inn to "The Buxton Inn" and it has kept that name ever since. Major Buxton and his wife really brought the inn to life and were known for the warm hospitality. The inn gained a reputation as a good place to eat. Many Denison College students took up residence in the hotel while they were at school because it was just an inviting place. Ethel Houston "Bonnie" Bounell had been an opera singer and when she retired she took ownership of the Buxton Inn in 1934. Bonnie bought a cat and named it Major Buxton, after the previous owner. The cat was beloved by guests. Bonnie ran the place until her death in 1960. A woman named Nell Schoeller had assisted Bonnie in running the inn and she continued on after Bonnie's death. By 1970, the inn was beginning to fall into disrepair. Discussions began that the building should be razed and replaced with, of course, a parking lot. In 1972, Orville and Audrey Orr convinced Nell Schoeller to sell them the inn. She resisted until the Orrs detailed their plans to restore the structure. And restore the building they did. The Orrs also bought adjacent historic buildings and incorporated them into the property. The Buxton Inn now has four buildings, seven dining rooms and beautiful gardens with several fountains. The Orrs sold the property in 2014 to a partnership group led by Robert Schilling, a preservationist. Several other professionals in Granville are a part of the partnership and they are committed to the upkeep and preservation of the inn. The Buxton Inn is host to more than just the living. Several ghosts have decided to make this their home in the afterlife. Disembodied footsteps, doors opening and closing on their own, full bodied apparitions and whispered names are all experiences reported at the inn. A ghost cat has even taken up residence. By most accounts, the ghosts at the inn are friendly. The previous owners just cannot let the place go. Orrin Granger, who built the inn, is still here. His spirit started making the rounds in the 1920s with several sightings. One of these sightings was reported by Fred Sweet in 1920. His mother was the owner of the inn at this time. Fred got those late night munchies like so many of us do and he went to the kitchen seeking a snack. He was shocked to find a transparent figure eating the last piece of pie. He sat down with this figure at the table after his shock dissipated and had a conversation. Now most people would call this claim outlandish except for the fact that Fred knew nothing about the inn, especially about its early years of operation. When he told everyone about the ghost, he also shared information he could not possibly have known about the inn. He also told his mother that Orrin was pleased with the way she was running the place. Major Horton Buxton has been seen as a full body apparition in many locations around the inn. And Bonnie Bounell has been seen and felt inside the room where she died, room number nine. Her full body apparition is seen wearing her favorite color, blue. People who see her spirit refer to as "The Lady in Blue." Workers who were renovating in the 1970s saw a ghost in blue and refused to work at the inn after dark. Bonnie likes to open windows and move items. Her cat also haunts the inn. Many people claim to have seen or felt a ghost cat. "After being shown to our rooms we were told if we wanted to see some photos of ghosts to visit the front desk. Someone had taken a photo of Bonnie Bounell's ghost. When we got to the desk and the lady showed us the photo she told us although others claim to see a ghost in the photo she could not see it. We agreed, we could not see it either. Then we were shown a photo of the Buxton Inn ghost cat. The photo was taken down in the tavern and it showed a cat's head which appeared to be hovering over a little girl. It looked like a blemish in the stone wall of the tavern to us. Upon inspection of the area where the photo was taken we saw that one of the stones had some blemishes that resembled a cat head. But that is all it was, a flaw in the stone, not a ghost cat. When we made reservations we informed them that we were coming for a ghost investigation. We were told that we would have full access to the basement and other areas. Since it was still early when we arrived, the inn was really busy so we decided to wait until the restaurant and tavern closed at midnight to do our investigating. We couldn't do a serious investigation with customers coming and going. About 12:30 we saw that most of the lights were out and all seemed quiet so we gathered our equipment and headed for the main part of the inn. The rooms are separate from this part of the inn. We soon discovered we were locked out of the of the inn. It was locked up tight. When we were told we would have full access we were not told that it was only until midnight. We called the desk and were told that after midnight the doors are locked and no one was allowed to enter the inn. We were greatly disappointed. We only had access to our rooms so that is where we had to stay. When you enter room number nine, you enter a small room that opens into a larger room. While sitting in the larger room we heard what sounded like the outside door knob turning but when we checked it was always locked and no one was outside. The sound never happened when one of us was in the smaller room where the door was located. Several times we heard what sounded like someone walking outside the door but again no one was there. We were the only occupants on the entire wing that night. We heard many sounds we couldn't find an explanation for but we didn't capture any evps and we didn't see any ghosts, cat ghosts or shadowy figures. We did capture something on video. As I was sitting in a chair in the corner of the room I saw something through the view finder coming towards me. I told the others what I just saw. It appeared to come out of the mirror. If it was a piece of dust it was huge. Some of us made the drive home that night and others stayed to sleep at the Buxton Inn. One of our members said she was awaken by something touching her. Perhaps it was one of the Buxton Inn ghosts." "We did have experiences in both rooms 7 and 9. My sister had something jump on her foot in the bed (we suspect it may have been the reported ghost cat) We heard heavy footsteps in the middle of the night and something held my friend down to the bed for like 30 seconds (it really freaked her out). In the other room (9) one of the ladies was wearing a breathing mask for her sleep apnea and heard giggles right next to her and then something hit the mask while on her face!!" "We did encounter weird things... one of us felt shoving on a shoulder and one of us was literally pushed out of bed during sleep and fell on the floor!! no lie, it happened!" "As I walked through the Inn to the dining area I started coughing, can't explain it... but felt like there were hands around my throat and I was being choked, same thing happened to my husband! The first night in our room I felt a sensation of fingers lightly touching my arms." The Buxton Inn has stood for over 200 years. Thousands of people have stayed in the rooms. Could it be possible that some have stayed in the afterlife? Are those footsteps in the hall coming from the ghostly feet of a former owner making the rounds? Is The Buxton Inn haunted? That is for you to decide!